Leanda Gavin (right) and University of Arkansas students Chris Bryant and Katie Sargent were among the two dozen volunteers helping to catalog the Sargent collection. In August 2015, the Survey received the Sargent collection, assembled by four generations of the Sargent family from sites near their homes in Hot Springs National Park. This collection is the largest ever donated to the Survey by private citizens, and will be a valuable research and public education resource for decades to come. The most active collector in the Sargent family was Forest Sargent who worked for the US Postal Service but spent time off surface hunting at nearly 40 sites near his home between the 1930s and the 1960s. 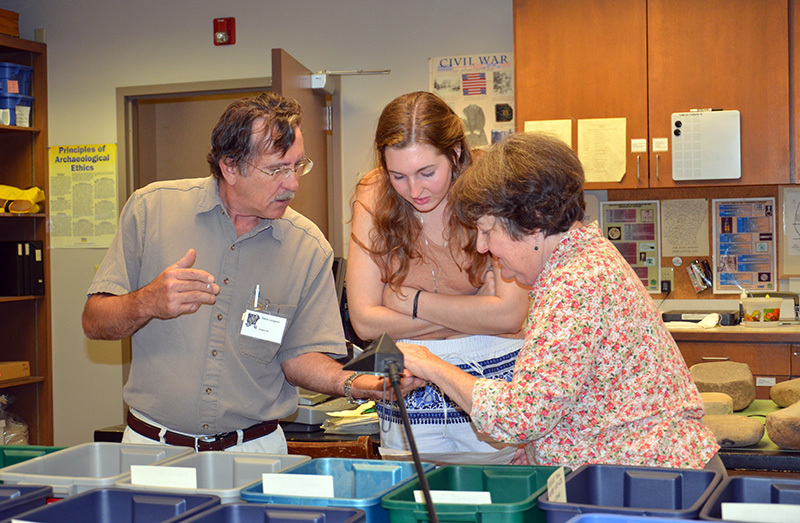 Early in the 1960s, Forest began cataloging all of his finds by the site of discovery, and discussing his discoveries with University of Arkansas Museum preparator, Hester Davis. He recorded his collecting sites first with the Museum and later with the Arkansas Archeological Survey. When Survey archeologists began working in southwest Arkansas, Mr. Sargent shared his information and collection with them and helped them begin to learn about important sites in the region. Among those archeologists was Dr. Frank Schambach who applied Mr. Sargent’s wisdom and artifacts to his own dissertation research on two University of Arkansas Museum WPA (Works Progress Administration) excavations that took place near Mr. Sargent’s home in the late 1930s. James A. Scholtz, the Survey’s first regional archeologist at the HSU Station in Arkadelphia, helped Mr. Sargent record several of his newly discovered collecting areas in the late 1960s. Mr. Sargent died in 1984, and the collection has been cared for by his son, Al Sargent, and family until the donation this year. The Sargent Collection will be a valuable research and public education resource for years to come. 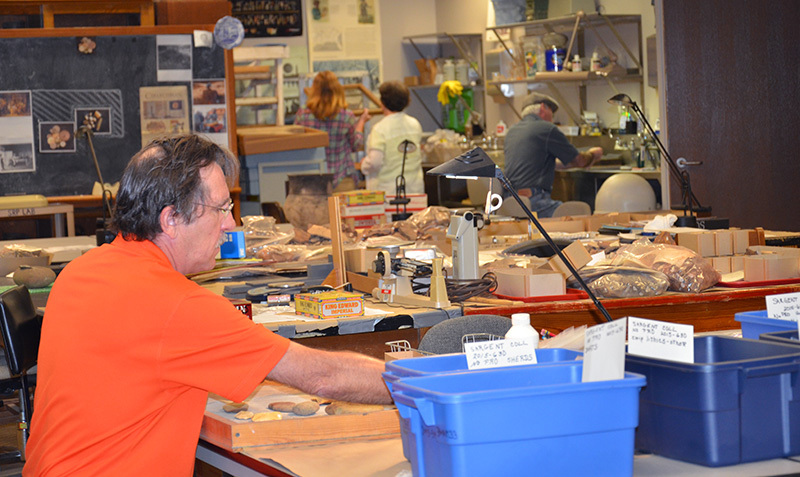 Here Arkansas Archeological Society member Steve Longacre assists in processing the collection. 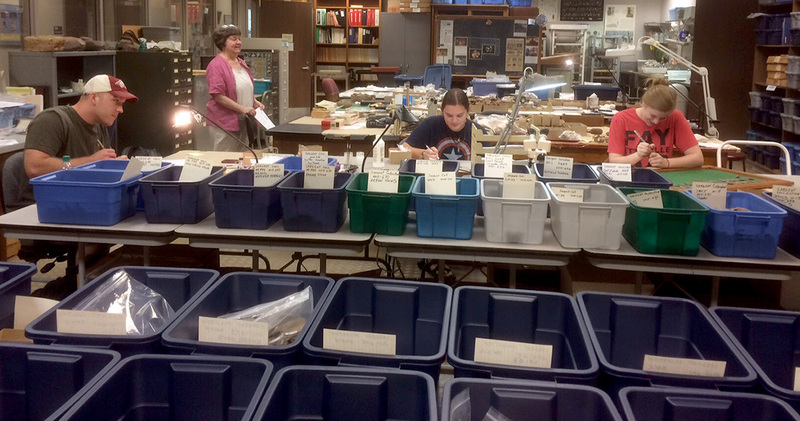 Since August, two dozen volunteer students, Arkansas Archeological Society members, and Survey staff have been unpacking, cleaning, cataloging, and making an inventory of the collection. Among the volunteers is Katie Sargent, the fourth generation member of the family associated with the collection and an undergraduate student in Anthropology at the University of Arkansas. Most of the artifacts are stone tools—Mr. Sargent didn’t collect waste flakes—and work on the stone artifacts is winding down in January. 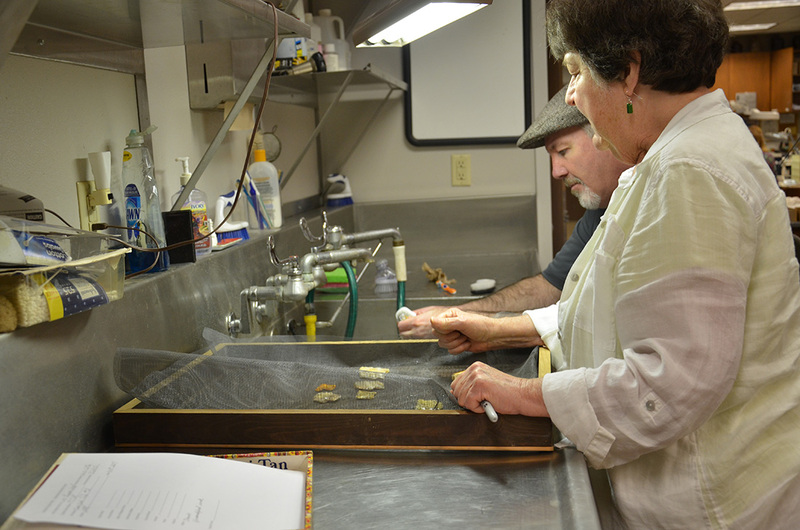 Thus far more than 40,000 artifacts have been cataloged, and there are a few thousand more to go. When the cataloging is completed, the collection will be housed in the regional research Stations in Arkadelphia and Winthrop Rockefeller Institute on Petit Jean Mountain. 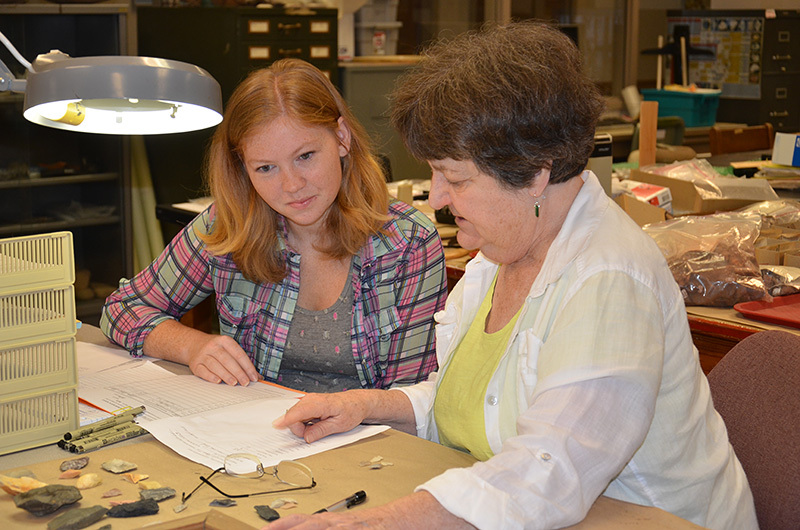 State Archeologist Dr. Ann Early providing cataloging instruction to volunteer Leanda Gavin. The collection consists of more than 40,000 artifacts assembled by four generations of the Sargent family. 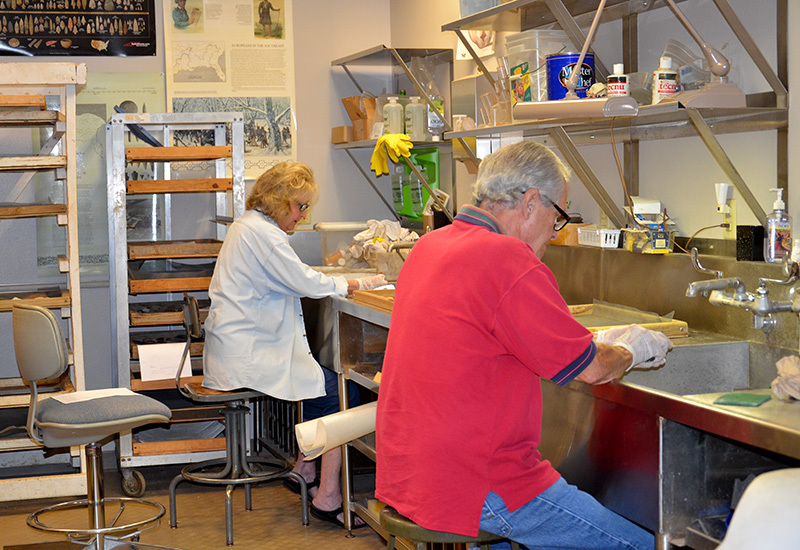 Volunteer Devin Holland cleans artifacts under the guidance of Dr. Early.